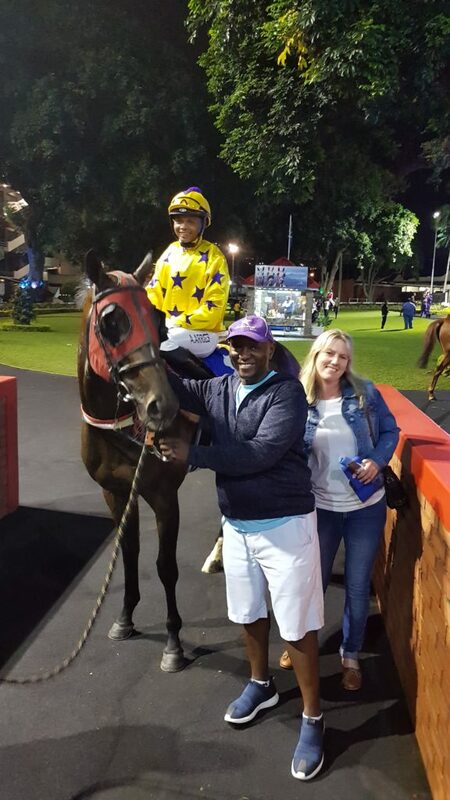 The Hollywood Syndicate had two runners at the Greyville Polytrack meeting on Friday the 20th April 2018, with HONEST PRINCE and SUNNY BILL DU-TOY representing from the Alyson Wright stable. HONEST PRINCE took part in the 1200m third race, and started from barrier position 4 under the guidance of jockey Ashton Arries. The young apprentice rode a great race as he sat well back in the field off the hot pace that was set up front. 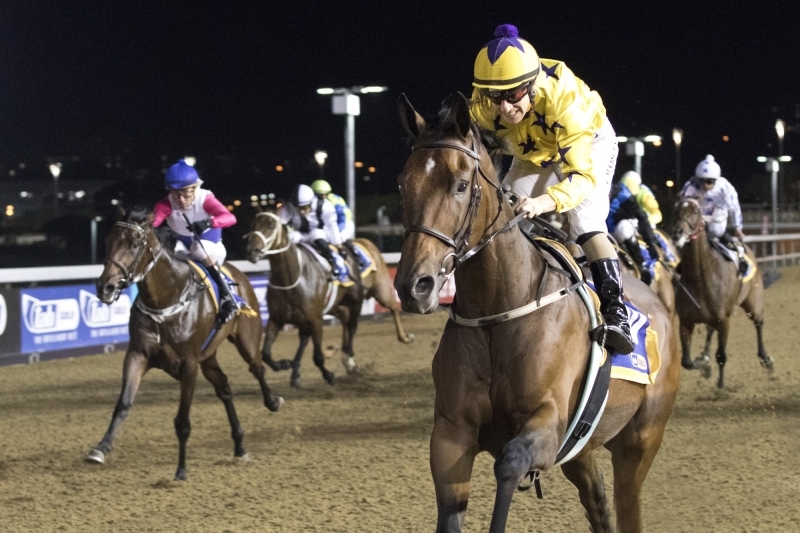 The gelding was beaten by a nose on the line as he produced a powerful finish, only to be pipped on the line by the race favourite Roy’s Taxi. It was a promising run, and a great sign of things to come for this four-year old. Honest Prince after his 2nd place finish. SUNNY BILL DU-TOY started the 1800m fourth race as an odds-on favourite from the wide draw of 10. 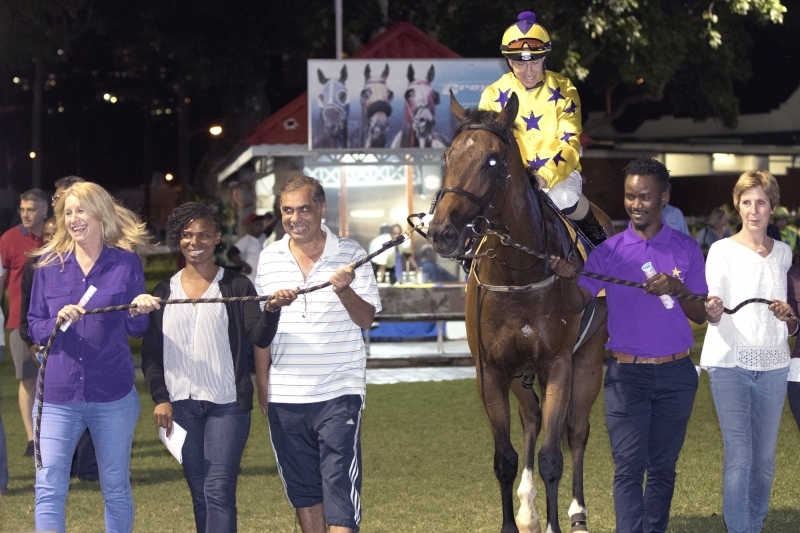 There had been strong betting support for the three-year old gelding with the course abuzz for the banker of the night! The sight of a large Hollywood presence on track added to the late race time money. Anton Marcus was the pilot on board, and rode him to perfection, winning the race by three and a half lengths and never giving punters an anxious moment when given his head and sent for home. This was SBDT’s maiden win, and a very impressive one at that, he relished the step up in distance and we will be hoping to see even further improvement as he learns what racing is about. All in all, a good night for the Hollywood Syndicate! We had a big number of connections at the course, including Suneal Bathoi, who Sunny Bill Du-Toy is named after! Well done to Alyson, Kevin and Gee Wright Racing on a good night out!